Let me just admit something right now. I’m the guy who thought Robert DeNiro had some funny moments as the Dirty Grandpa. 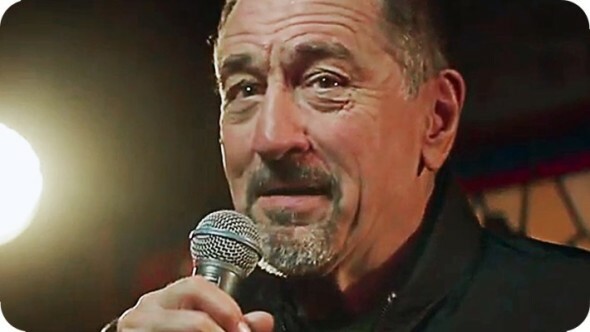 Now DeNiro is The Comedian and..anybody seen Grandpa? One of the curious aspects of the film is that even though it’s more of a character study than an outright comedy, that character is a legendary comic who’s not really that funny. DeNiro stars as Jackie Burke, an insult comedian who hit it big back in the day with a smash TV sitcom. Nowadays, he chides his manager (Edie Falco) for the meager gigs while resenting fans who just want to hear him repeat his old TV catch phrase. An encounter with an aggressive heckler goes viral, and suddenly Jackie is hot again..while serving 30 days for assault. He meets Harmony (Leslie Mann) while fulfilling community service hours, and director Taylor Hackford dutifully kicks off a series of situations in search of greater cohesion. As Jackie and Harmony go to comedy clubs, weddings, and dinner, Jackie is always cajoled into doing a quick routine that isn’t nearly as impressive and everyone tells him it is. By the time Jackie goes viral again with a retirement home performance of a parody song about “making poopie,” the antics are more embarrassing than amusing. An old school comic facing the truth that “being funny isn’t enough anymore” could have been fertile ground for a more layered, meaningful character. The Comedian isn’t interested. Veteran standup comics are among the film’s writers, comedy consultants, and cameo stars, but the script never gives Hackford the ammo to dig any more than surface deep. What Hackford does have is a talented cast (including Danny DeVito, Harvey Keitel, Patti LuPone and Cloris Leachman), and he keeps all the actors engaged enough to deliver terrific performances, regardless of screen time. That’s about the best reason to see The Comedian, a film that seems content to put off getting its act together in favor of just wandering around backstage.